The best way to save electricity from using your light bulbs is to open your blinds and let the sun shine through. Which is why utilizing your blinds to its fullest potential is important. Our project is about creating a user friendly automated blind system created to raise, lower, tilt up, and tilt down the blinds at the click of a button on your phone. We decided to make this as it is rather cool to alter your blinds without moving anything except your finger, not to mention it saves time and money. Configuring three photons in this project was a little tricky. Jacob and Daniel controlled the blinds, while Patrick published live data. Jacob’s photon is connected to have the blinds raise up or lower down, and Daniel’s photon is connected to tilt open or tilt close the blinds. These photons can be controlled through the Blynk app, where a switch enables the blinds to open/close and go up/down. A 12V DC motor was used to power the blinds to go up and down. We wanted to connect the motor to the strings of the blinds. A spool was 3D printed and directly fitted onto the motor shaft which allowed the motor to pull the blind strings. An online code from Particle allowed us to easily implement code to connect the Blynk app to the photon. This allows the motor to turn on and off whenever the switch is selected. However, we had to press the switch again to turn the motor off. The switches on Blynk can turn on/off the motor in each direction. Since nobody’s perfect, we knew this could potentially burn up the motor if we forgot to turn the switch off. Magnetic sensors were placed on the top and bottom of the blind to resolve this issue. These sensors turn the motor on and off. The sensors ground out the connection when switch is turned, thus grounding the pin that the photon is using. A 3V DC motor was used to tilt open and tilt close the blinds. Initially, we wanted to place this motor in the upper blinds frame. Several gears were 3D printed to try to allow the motor to connect to the blind shaft and tilt the blinds. This ended up not working because the motor wasn’t strong enough. The gear that was printed to fit onto the motor shaft had a similar diameter to the blind wand. We kept the gear on the motor shaft and super glued it to the wand. The force needed to twist the wand was much lower since the gear box for the wand was 1:10, so the motor was able to turn it, which allowed the blinds to tilt open and close. Magnetic sensors weren’t used since tilting the blinds open and closed only takes a few seconds. This photon is also controlled by a switch on Blynk. This switch must be turned off when the blinds are set at the desired position since there are no sensors to automatically stop it. Two switches were used in Blynk that give the motor power to both terminals. When one switch is on and the other is off the blinds will tilt open (CCW rotation of motor); utilizing the H-Bridge. When the switches are reversed the motor will rotate Clockwise. Jacob’s and Daniel’s photon send data to Patrick’s photon, which then publishes live data through IFTTT. 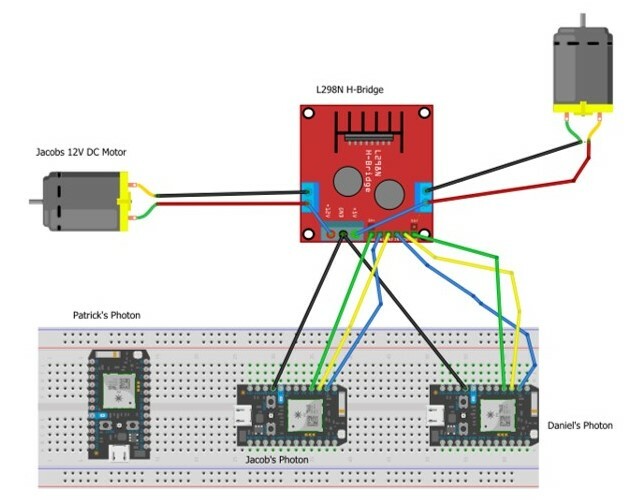 Coding the photon to publish data through IFTTT was the hardest part of this project since we had to figure out how to publish data through two photons. //   We allow 1 tweet per minute for now. //   Twitter doesn't allow identical subsequent messages. // Pushing notification to the app! //   We allow 1 notification per minute for now. analogWrite(D3,120); //number determines pwm effort. 1024=max? digitalWrite(D3, HIGH); //number determines pwm effort. 1024=max?